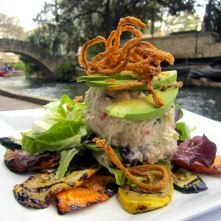 The chicken salad veronique offers a twist on the traditional chicken salad with the grape-pecan chicken salad over Texas field greens, avocado, grilled carrots and yellow squash tossed in a champagne-chive Dijon vinaigrette and garnished with fried onions. Slice ¼ of an onion into thin slices. Marinate onion slices in Worcestershire sauce for 5 minutes, then drain. Dip onion slices in seasoned flour (salt, pepper, and granulated garlic). Shake off excess flour and fry. Place on top of Veronique salad. Slice carrots and yellow squash and rub with butter, salt and pepper. Grill until tender. Place grilled vegetables on plate in a circular pattern. Combine dressing ingredients and toss vinaigrette with field greens. Place field greens salad atop grilled vegetables. Mix ¼ cup grapes with chicken salad. Place Veronique chicken salad atop the field greens salad. Garnish with fanned avocado and fried onion.